Giveaway! Reviews Written By: Jonathan A. *EDIT* I didn’t completely feel the need for a warning, but the game is kind of “graphic” in an 8 bit way. It’s kind of cartoony and everything you “kill” is already dead soooo… if you think it may be too much for you, please don’t watch and then complain. That would just be goofy. So as you can see from the video… I’m terrible at the game. I’m working on it though. Dead Pixels is an 8 bit romp through a devastated city. Zombies are running a muck and there are a few different modes to explore this game: Dead Pixels, The Solution, and Last Stand. All of these can be played Co-Op, how frig’n cool is that? 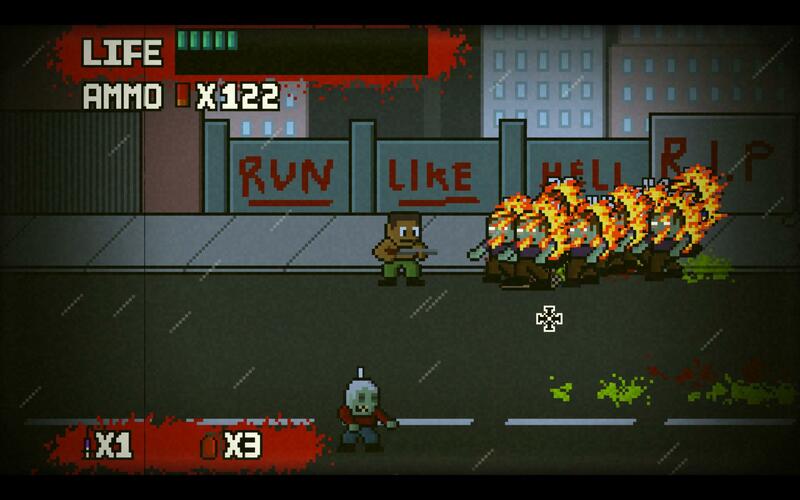 You fight through hordes of zombies through 20 streets to get to your freedom. Along the way, other than zombies, will be houses/stores you can ransack for goodies. Sometimes it’s ammo and sometimes its weapons or tradeable goodies. The goodies are for the random vendors that seemed to be making the best of this zombie Apocalypse via capitalism. Kind of a punk think to do, but these zombies don’t seem to know how to open doors. So unless someone who visits was raised in a barn, the doors are always safe and closed. (No offense to those raised in barns.) Every vendor wants some kind of item they are willing to pay quite a bit for. Normally it’s more random that it seemed to be in my play-through above. Most wanted the same thing, and that was weird, but there is no accounting for taste. This mode is your second type of zombie movie. It’s the more action oriented version if you will. You are an inmate in a correctional facility and you’re “the solution”. They send you in to go to a power plant and flip a switch. I’ve made it to the power plant, but I haven’t made it out. So my pardon is waiting for me, but I’m not sure when I’ll see it. Capitalism at it’s greatest. People charging a ton for survival equipment during the Apocalypse. What are they going to use the money for anyway? The shops are everywhere you want them to be unless you need them that is. That and The Solution mode. There are no vendors in this version of the game. It’s just you, your weapon, and a radio you can call in to buy stuff from the woman on the radio. The trick is she drops your shipment in the middle of the next zone. I don’t recommend waiting until you have 3 bullets before calling her in. You also only have a few uses, so you’ll have to play it smart. This mode seems to be a bit easier, even on the same difficulty due to the game being shorter (even though I can’t beat it lol). Well if this one isn’t self explanatory… it should be. There are a group of survivors who are almost to safety except that a giant crowd of zombies block the final approach. One of the group grabs a boombox from the 80’s and grabs the attention of the zombie horde so the others can make it to safety. Guess which character you are… simple answer is you’re not getting on the helicopter. There are vendors in this mode and all you’ve got to do is survive for a certain amount of zombie rushes or play the “kill’m to they get you” mode. That’s not the official name, it’s just what I call it. The important fact is that you can play all of these in Co-Op mode. Such a good idea to make an already fun game into a more fun game. I may actually beat this game if one of my buds wins the contest or if I can convince them to pick up a copy. Overall: The game is a blast (shotgun pun intended). 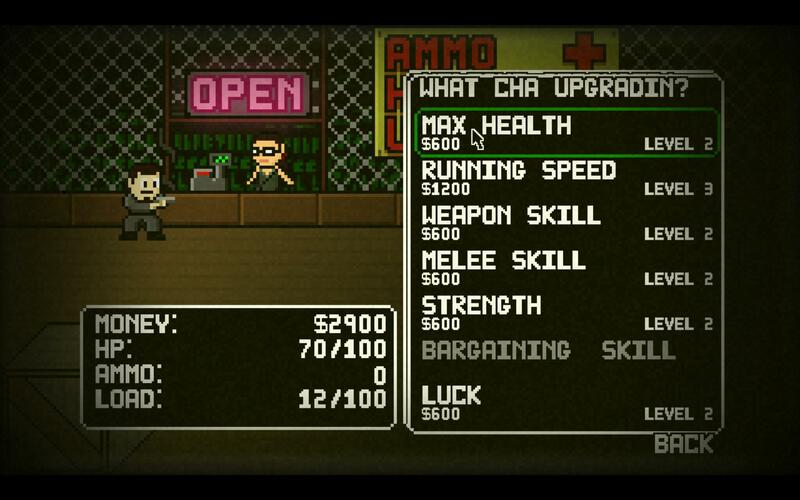 There are 3 game modes, 8 bit glory, multiple weapon types, and Co-Op. This game has a lot for as little as they charge. It’s a great value. The Rules of the contest! 1. So the zombie Apocalypse has arrived and you are all alone. What weapon would you bring and why? It can be funny, realistic, campy, artsy, or just plain crazy! Wanna draw a picture? Sure! Can’t draw, but can think up a crazy story, do it! (I can’t draw a stick figure to save my life so don’t feel bad if you fit into category number two.) Keep in mind that while you can write some funny stuff, I have to personally read it so books aren’t fully appreciated unless they are that good. IMPORTANT: Remember to not be offensive in your entries. If you’re questioning whether or not what you are doing is offensive or not, that’s probably a good sign to not do it. I would like to post the stories/reasons and/or pictures on the site. 2. Email your entry to Contest.TVGBL@gmail.com with “DEAD PIXELS CONTEST” in the subject. Remember to give your name or nick-name that you use to post comments here with and your Steam name or email so that if you win, I can actually give you a copy of Dead Pixels. You will need Steam to play this game! 3. Wait two weeks and cross your fingers. Winners should be announced on June 14th. I’m a huge fan of puns and your entry doesn’t have to be huge, you just have to get me to like it. in your pros, you say, “doesn’t play like an NES game.” My immediate reaction to seeing the graphics was, “the characters of the game look like the old NES Dodgeball characters!” May…I used to play the heck out of that game. Unfortunately for the undead, they don’t seem to be able to dodge a wrench…let alone a gun shot. Have you tried the “Hardest” option yet? I would be interested to find out how very difficult this game can achieve. I would also think that online co-op would be a lot of fun. “Doesn’t play like an NES game” in a good way. Sometimes those older games would just make you want to take a bite our of your controller than continue playing. That’s why this was a pro, ’cause I didn’t want to bite something, just continue with my crusade against the undead. Someone should apply for the contest and maybe we two could get our zombie apocolypse on. A Shotgun is the ultimate zombie-killing weapon. Nothing could get close if you have a semi-auto. Plus Ash from Army of Darkness uses one and he is the coolest man I know. I have to admit, the shotgun is a pretty pimp weapon whatever the apocalypse. Oh hey, if you wanted to send that comment in for a chance to win this game via the contest above, you can send it to contest.tvgbl@gmail.com. I’ll totally consider it before I delete it from my inbox.